We all love cheese, but how well do you know your cheese ? In our series of articles on cheese, we will discuss some interesting facts and pairing ideas, for different types of cheese, starting with the Gouda. Gouda is one of the oldest recorded cheeses in the world, that is still made today. Historians date the cheese back to the 12th century. The cheese is named after the Dutch city of Gouda, not because it is produced in this region but historically, farmers from the surrounding area would bring their cheese to sell in Gouda on market days. It is traditionally made from cow's milk although some artisan varieties use sheep's or goat's milk. A few Dutch farmers still make the cheese in the traditional manner, using unpasteurized milk. This is called boerenkaas (farmers cheese). Most Dutch Gouda today is industrially produced. The name Gouda is used today as a general term for a variety of similar cheese produced around the world in the traditional Dutch manner. Gouda cheese is an excellent source of vitamin K2 which is essential for good health, resistance to aging, some protection from cancer, diabetics and degenerative disease. It also provides vitamin B12 which slows down brain aging, protects against heart disease and facilitates the growth of nerve cells. Most Americans wrongly pronounce Gouda as 'GOO-duh'. The correct pronunciation is "GAOW-duh" or "HOW-duh". Gouda has a rich, creamy texture, slightly sweet flavor with fruity taste and a mild nutty flavor. With aging, it develops an intense, complex, nutty, caramel flavor and a firmer texture. The preference for young or aged Gouda, depends on individual palate and liking for mild or strong flavors. Gouda is a perfect pairing with fruits, crackers, bread and mustard. An aged Gouda can be eaten on its own, if you enjoy its complex nutty flavor. Gouda cheese can be paired with beer, wine or whiskey, but the pairing will depend on the age of the Gouda. The important aspect of pairing is to achieve balance of flavor, as the cheese should not overpower the drink or the drink should not bury the flavor of the cheese. 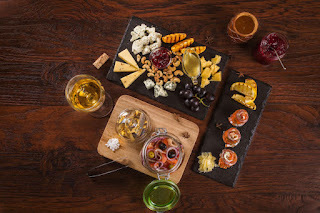 The flavor descriptors in a Gouda such as nutty, smoky or sweet are also found in different beers and whiskies hence the pairing can complement each other. Gouda pairs well with brown ales or amber ales, which have a nutty, caramel flavor. Aged Gouda goes well with a stronger and maltier doppelbock, Belgium dubbel or a stout with roasted coffee and chocolate flavor. Smoked Gouda is a good pairing with Bock beer which has a strong toasted flavor or a smoked porter. Gouda with its mild nutty flavor and fruity taste is a good pairing with Champagne, Cava, Sauvignon Blanc, Riesling, Pinot Noir and Merlot. A slightly smoked Gouda, will enhance the pairing experience and also complement a Zinfandel or Shiraz. An aged Gouda with a more complex nutty flavor goes well with a Chardonnay, Riesling or Tawny Port wine. 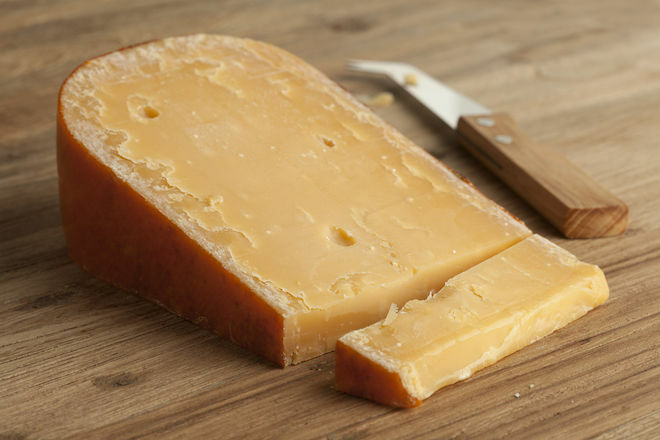 Gouda pairs well with a single malt scotch from Speyside because of its combination of nutty and fruit flavor. An aged Gouda goes well with an aged bourbon or rye whiskey or a Highland scotch with more intense flavors, while a smoked Gouda is a good pairing with a peated scotch or whiskey.